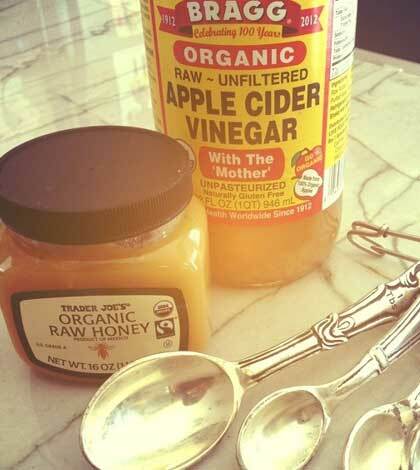 Yes, apple cider vinegar is the latest obsession! You might have already seen people singing its praises on the internet through blogs and health articles; the health columns in newspapers are full of it and your friends are the newest members to join the detox bandwagon with apple cider vinegar. Is that making you consider detoxifying with apple cider vinegar too? Well, you’ll be happy to know that you’re making the right choice; but, how does apple cider vinegar work as a beneficial detox drink? Apple Cider Vinegar is prepared by fermenting apple juice and it is much more than a salad dressing; it is a holistic health product with innumerable benefits for your overall wellbeing. Apple Cider Vinegar is that beauty secret used by your favorite celebrities and models for shiny hair, flawless skin and a toned body. This health tonic has proven beneficial to aid digestion, maintain clear skin and luscious hair, lose weight, cure medical ailments and improve the overall quality of health. The process of detoxifying the body involves the flushing out of toxic substances from the body. There are many ways in which one can undergo a detox; some swear by a liquid diet, some consume only fruits while others only devour vegetables with high water content. Did you know that Apple Cider Vinegar is a beneficial detox drink? Organic and unfiltered Apple Cider Vinegar brings a number of health benefits with its use. Let’s explore some of its health benefits which you can avail of. While the health benefits of Apple Cider Vinegar have not been scientifically proven, many consumers swear by it as a health tonic used especially to detoxify the body and release weight. Consuming Apple Cider Vinegar 30 minutes before a meal can kick start your metabolism, improve digestion and help prevent indigestion. Say bye-bye to tummy troubles! Apple Cider Vinegar also leaves you feeling full, which makes you consume lesser quantities of food; thus, acting as a healthy weight loss strategy. Get rid of those extra pounds! Apple Cider Vinegar helps regulate bowel movements. This ensures the effective and timely removal of toxins from the body. Now doesn’t that make it a great detox drink? Is the flu getting to you? Keep your guard up with the regular consumption of Apple Cider Vinegar and prevent sore throats, common cold and sinus infections. If your multiple efforts to rid your skin of acne have remained unsuccessful, try Apple Cider Vinegar as an effective remedy and let clear skin reveal itself to you. If you can’t seem to WAKE yourself up even after waking up or you feel drained off every ounce of energy after exercise, Apple Cider Vinegar can make you feel alert, lively and full of fresh energy. Now you have six persuasive reasons to rush to the nearest store and buy that bottle of Apple Cider Vinegar. So, will you or won’t you?